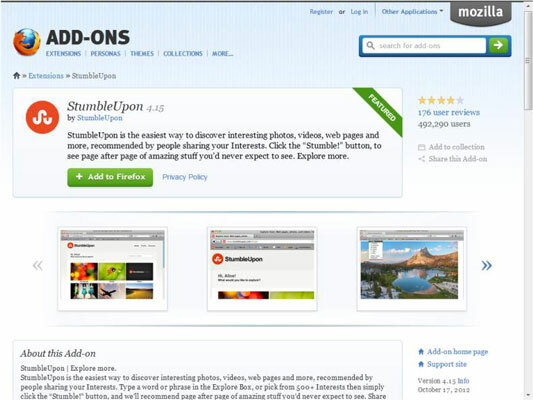 StumbleUpon offers a great time saving tool in its StumbleBar, which you can install as an add-onyou’re your browser. 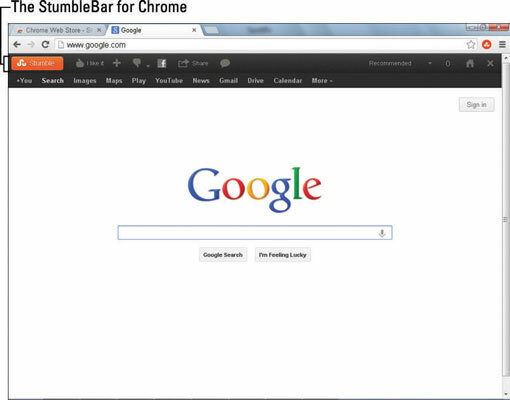 Don’t worry, because you’re probably partial to a particular Internet browser, there are easy instructions on how to install the StumbleBar on Chrome and Firefox. Unfortunately for you Mac Safari users, StumbleUpon does not currently support the StumbleBar for Safari. Point your Internet browser of choice to Downloads for StumbleUpon. You’ll be greeted by a page that gives you several options for downloading the StumbleBar, each tailored to a specific browser. 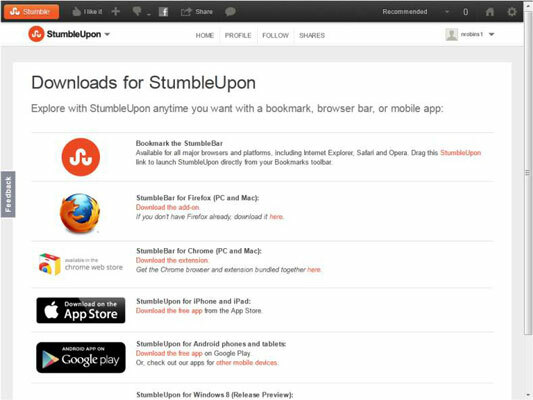 On the StumbleUpon Downloads page, you’ll notice that the first download item in the list is a bookmark link to StumbleUpon. Just drag that hyperlink — named, appropriately enough “StumbleUpon” — to the Bookmarks toolbar of your Internet browser. In IE10 on Windows 8, the Bookmarks toolbar is called “Favorites” and is hidden by default. You’ll need to enable the Favorites toolbar. After you successfully place the StumbleUpon button on your browser Bookmarks toolbar, all you have to do is click the button and you automatically Stumble. Okay, you have that shiny new StumbleUpon button on your browser Bookmarks toolbar. Now it’s time for the real work installing the StumbleBar. If your browser of choice is the Chrome browser and you want to do all your Stumbling by using the StumbleBar for Chrome, go yet again to Downloads for StumbleUpon and click the Download the Extension link underneath the StumbleBar for Chrome (PC and Mac) heading. The next page is an overview of what you’re actually downloading into Chrome. Here you find details about the Chrome extension, as well as reviews by other users. After you browse around, click the Add to Chrome button in the upper-right corner. On the next screen, a window pops up asking (quite politely) “Add StumbleUpon?” The extension asks nicely because it needs your permission to access your data on all websites (including all tab/browsing activity) to function as planned. Go ahead and click Add. 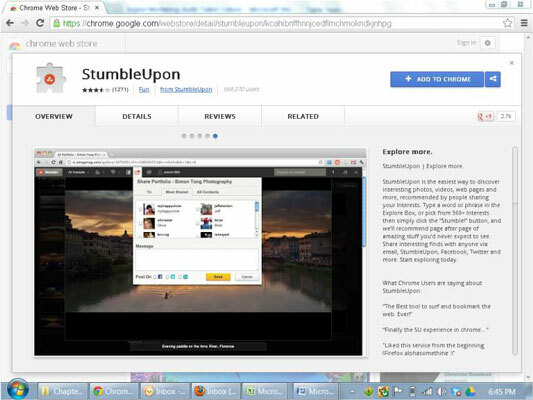 After the StumbleBar is downloaded, a new tab with the StumbleUpon Sign In page opens. Sign in to StumbleUpon, using the username/e-mail and password you created when first signing up for the account. After you are signed in to your account, you have successfully downloaded the StumbleBar for Chrome. To see how things would work if you’re partial to the Firefox browser and would prefer a Firefox-specific StumbleBar, go to (you guessed it) Downloads for StumbleUpon and click the Download the Add-on link underneath the StumbleBar for Firefox (PC and Mac) heading. The next page is an overview of what you are downloading into Firefox. 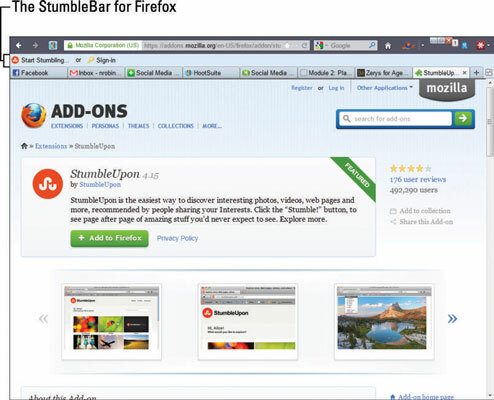 Feel free to browse the reviews to get others’ take on the Firefox version of StumbleBar. After convincing yourself of the extension’s value, go ahead and click the Add to Firefox button. On the next screen, a warning dialog box pops up with the message Install add-ons only from authors whom you trust. Don’t worry, it’s in StumbleUpon’s best interests not to infect your devices with malicious software. Go ahead and click Install Now. After the StumbleBar is downloaded, you see a dialog box pop up that says StumbleUpon will be installed after you restart Firefox. Go ahead and click Restart Now. After Firefox restarts, you see new features at the top of your browser. Make sure to sign in to start using the StumbleBar by clicking the Sign-In button there at the top and typing in your login details.